Rumblings of an Apple car started years ago, but now the talk is turning from fumes into something much more concrete. For one, Apple's self-driving test cars have been spotted on the road, including by TechRadar as seen in an exclusive video. What's more, the very official California Department of Motor Vehicles has issued permits to Apple to test self-driving car tech. And finally, Apple itself has confirmed its interest in the self-driving space. If you need more evidence that Apple driverless car tech is in the works, we don't know what else we can say to convince you. But big questions remain. Namely, what form will Apple's self-driving car tech take? Will it be an actual Apple Car? Will it be tech we can buy and integrate into our own vehicles? Will it be hardware and software licensed to third-party car makers? Or, will it be part of a service, run by Apple to transport us around in driverless cars? We won't know the answers to these questions until Apple itself makes a self-driving car announcement, so until then, we've gathered up everything we know about the Apple car right here. When rumors of the Apple car first started, it was said that the tech giant was making its own electric vehicle. This wasn't just the stuff of fantasy; reports indicated Apple had gone on a hiring spree, including plucking top talent from the automotive industry, to build out a team that would create the iCar. But, as the years went on and no Apple Car appeared, whispers began to circulate that Apple may have bitten off more than it could chew when it came to producing a car, steering wheel to wheels, so to speak. Then, in April 2017, it was discovered that the California Department of Motor Vehicles (DMV) had issued an Autonomous Vehicle Testing Permit to Apple, allowing it to conduct self-driving car tests in the state. At around the same time, eagle-eyed observers began spotting mystery SUVs decked out in self-driving car gear that appeared to belong to Apple. The first sighting came less than two weeks after the DMV permit discovery, when a white Lexus with a large rig housing what appeared to be autonomous car tech was seen leaving an Apple facility. Six months later, in October 2017, another white Lexus with lots of self-driving gear was spotted, and the person who filmed it happens to have co-founded an autonomous vehicle startup, so he knew a thing or two about self-driving cars. This car had a noticeably updated rig compared to the earlier sighting. According to MacCallister Higgins, the person who saw the vehicle, the large rooftop hardware probably contained “the majority of the compute stack,” which makes it different from most self-driving cars that would usually house this hardware within their trunks. The self-driving hardware, then, can be placed onto vehicles with relative ease, allowing for testing without much modification to cars. This could also mean that Apple's self-driving tech could one day be sold as an add-on to consumers or third-party manufacturers, if Apple decides to make its tech publicly available. By now Apple's secretive car project also had a codename: Project Titan. But it wasn't just sightings and anonymous reports giving us details about Apple's self-driving car plans. We soon heard word from Apple's head honcho himself. In June 2017, Apple CEO Tim Cook spoke out publicly about Project Titan, to many people's surprise. Okay, Cook didn't name Project Titan specifically, but he did confirm Apple's interest in the self-driving car space. Specifically, Cook said Apple is focusing on "autonomous systems," suggesting the company is interested in building the AI brains that power driverless cars rather than producing the mechanical components of a vehicle on its own. "We sort of see it as the mother of all AI projects [...] It’s probably one of the most difficult AI projects actually to work on," Cook said in the interview with Bloomberg Television. So, it would seem that Apple's driverless car plans revolve around creating the software that powers self-driving cars, rather than creating an actual car or even hardware for a driverless vehicle. This makes sense. Apple is not a car manufacturer (in case you hadn't noticed), and its best chance at excelling in the space would seem to stem from developing cutting-edge autonomous systems that serve as the brains of a vehicle, built by someone else. Apple isn't staying confined to the lab when it comes to testing self-driving car tech, however. It was recently confirmed by the California DMV that Apple has an autonomous testing permit that covers 55 self-driving cars and 83 drivers in the state. This is a huge leap from the three cars it started out with in 2017. This figure gives Apple the second most self-driving cars in California behind GM Cruise and ahead of Google's Waymo. Waymo counts 51 self-driving cars under its permit in the Golden State, while GM Cruise has the most with 104. 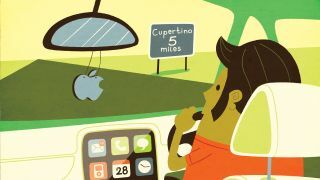 In May 2018, TechRadar filmed exclusive video of an Apple self-driving car on the road in and around Apple office buildings in Sunnyvale, California. This new sighting revealed some notable changes from the last time the vehicle was caught on camera, suggesting Apple's self-driving car tech has possibly undergone another update. The biggest change between this car and those in previous Apple car sightings is that the lidar sensors and cameras are much more prominent. Previous sightings have shown the puck-shaped lidar and cameras encased in white coverings, but this vehicle doesn't have anything obscuring these components. The lidar pucks are also more vertically oriented; previous sightings showed the lidar positioned at an angle. Additionally, this vehicle has three lidar total on the rear of the roof rig, down from the six seen previously. It could be that Apple simply did away with lidar and camera casings and made some configuration adjustments in this model while keeping the actual technology the same. Apple's self-driving car plans are not so mysterious any more, so it could be the company is lifting the veil on its tech, just a little. As we've mentioned, Apple's car project has hit some bumps along the way, but that hasn't stopped the tech giant from forging ahead with its self-driving car plans. And it's not just mystery cars and veiled hints that Apple has going for it. A report from May 2018 by the New York Times points to Apple partnering with Volkswagen to develop self-driving shuttle buses that would cart Apple employees between its Silicon Valley campuses. According to sources for the NYT, the project is the primary focus of the Apple car team, though it, too, has fallen behind schedule. Apple apparently wanted to partner with the likes of BMW, Mercedes-Benz, Nissan and even McClaren for a large-scale partnership, but these never came to fruition because Apple wanted the internal car design schematics and access to driving data from partners. So, in came VW, fresh off its emissions-cheating scandal. Sources said VW donated T6 Transporter vans and allowed Apple access to its data. The two companies have allegedly been working on a joint electric, self-driving T6 van prototype in Turin, Italy. Sources claim the model uses the frame, chassis and wheels of the standard VW design, but say that Apple has swapped out the dashboard, seats and electric car battery, and added the lidar sensor rig we’ve already seen. The van would be self-driving, not driverless, and require a two-person team – a safety driver and monitoring operator – at all times. Though the project is reportedly behind schedule, having already missed its 2018 deadline, this is certainly a realistic project for Apple to undertake to get its self-driving tech on the road. Not only is it working with an established car maker, but creating a self-driving shuttle service for its employees would be an invaluable case study. Yet another area Apple could be working on is entertainment for when you are inside a self-driving car. An Apple patent filing, uncovered in March 2018, demonstrates how VR headsets could be worn by passengers in a self-driving car, rendering windows with a view of the outside world – or indeed any world that the occupants of the car wanted to go through. Fancy a tour through Jurassic Park? Done. You could even use the VR experiences to hold a virtual meeting in a virtual office space, according to the patent. The VR goggles could help reduce motion sickness, Apple says, and make self-driving cars smaller and safer. If no windows are needed, car designs could potentially be more compact and better able to withstand collisions. Of course, this is just a patent, and not confirmation that anything official is in the works. However, it does show that Apple is thinking about self-driving cars, specifically what we'll do when we're just sitting around inside them. Maybe the Apple VR headset will be ready by the time Apple's self-driving cars are on the road. Who are Apple's biggest self-driving rivals? Apple is far from alone in the self-driving car space. Its rivals are numerous, and most are way ahead of it when it comes to driverless car development. The biggest rival is of course Waymo, which was once Google's self-driving car project and is now its own company under Alphabet. Waymo is dominating the self-driving car space in nearly every way, from number of cars on the road to disengagements. It recently announced that it's adding 62,000 more Chrysler minivans to its self-driving fleet. That's in addition to the 20,000 all-electric Jaguar I-Pace SUVs slated to join Waymo's ranks in the coming years. Waymo's aim is to launch a self-driving ride-hailing service in Phoenix this year. As it's leading the pack when it comes to disengagements (when a human has to take over for the self-driving AI), number of cars and miles driven (6 million autonomous miles and counting), there's a good chance residents of Phoenix will be hitching a ride in a Waymo car before the year is up. Uber self-driving cars had been hot on Waymo's heals for a while, but a fatal accident in March 2018 derailed the ride-sharing service's tests. Following the fatal crash, when an Uber self-driving car in autonomous mode struck and killed a pedestrian, Uber suspended all of its self-driving car tests nationwide. It then announced in May 2018 that it was ending its self-driving car program in Arizona, and there's still no word yet on when tests will resume elsewhere. The preliminary report by the US National Transportation Safety Board into the accident revealed that while the car in the accident had an emergency braking feature, this was disabled because the car was in "computer mode." Uber says it does this to prevent erratic driving behavior. The fallout from the Uber crash won't just be felt by the ride-hailing company. Self-driving car companies everywhere will be under much closer scrutiny, and many will need to reexamine their own safety procedures to identify possible holes. What this means for Apple is that it, too, will be under the watchful public eye if and when it launches its self-driving car tech. It will need to make sure its systems are as safe as can be. But Waymo and Uber aren't the only ones doing self-driving cars. In fact, it's not just tech companies in the traditional sense that are developing driverless systems, but nearly every major car maker is working on some form of autonomous driving experience for their vehicles. Tesla has its Autopilot feature, and is perhaps Apple's biggest rival when it comes to aesthetics, should Apple ever decide to create or co-design a self-driving car of its own. VW, meanwhile, is testing autonomous parking at the Hamburg Airport with plans to launch the feature in its commercial cars by 2020. Jaguar, BMW, Nissan, Ford, Mercedes-Benz, Toyota, GM and Hyundai are just some of the big names that are tinkering with self-driving tech for their cars as well. It's only a matter of time before self-driving features becomes standard in most consumer vehicles. Apple may be working on self-driving tech, but it's entering a crowded playing field. The question is, will its tech do anything different? Current page: Is Apple building a driverless car?